Commemorate the Battle of the Death Star! Unframed paper giclee inspired by Star Wars: Episode IV - A New Hope. Limited edition of 125 numbered pieces, signed by the artist! Celebrate the immortal Star Wars series with this one-of-a-kind piece of art! 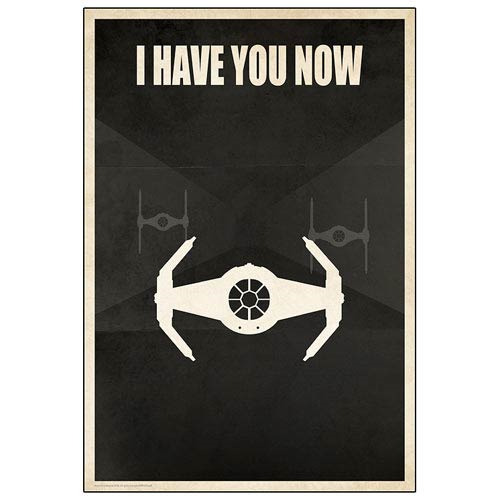 The marvelous giclee features Darth Vader's famous words - "I have you now." - from Star Wars: Episode IV - A New Hope. A limited edition of only 125 pieces, hand numbered and signed by artist Jason Christman, it offers a minimalist design with just the words and a few TIE fighters. A prize find for any Star Wars collector, the unframed work measures 18 1/2-inches tall x 12 1/2-inches wide and includes a certificate of authenticity. The Star Wars I Have You Now TIE Fighter Paper Giclee Print commemorates the iconic Death Star battle scene from Star Wars: Episode IV - A New Hope when Darth Vader in his specialized TIE Fighter nearly kills Luke Skywalker, who is attempting to destroy the Death Star. Luke narrowly escapes a harrowing death at the hands of his father, thanks to Han Solo and the Millennium Falcon.